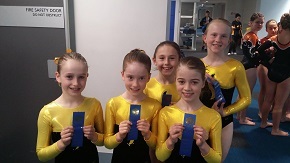 Our very successful competitive programs are overseen by Gymnastics Australia. The level your child may be selected for depends on their ability, personal goals and the hours they are willing to train. All children in our competitive programs are hand-picked by our Director and Team Head Coach and must undertake an assessment before being invited to train in our teams. Our competitive programs are only provided to a small number of gymnasts so we can keep the ratio in our competitive teams very low for more personalised and effective training sessions. Training hours vary from 4 to 12 hours per week depending on their level. LCGC offers Level 1 to 6 competitive gymnastics.